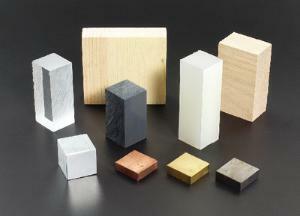 This set of blocks, developed by Jodye Selco, is an excellent complementary set to Density Blocks I. Students will observe that although each block has approximately the same mass, the size of each block is different because the density of each is different. The set includes one each of pine, oak, PVC, polypropylene, acrylic, aluminum, copper, brass and steel. Includes a sturdy storage box and teacher’s guide with activities. Grades 4–10. Set of nine.